Leeks done in the style of artichokes. AKA: Poor man’s artichoke, or, Hobochokes. 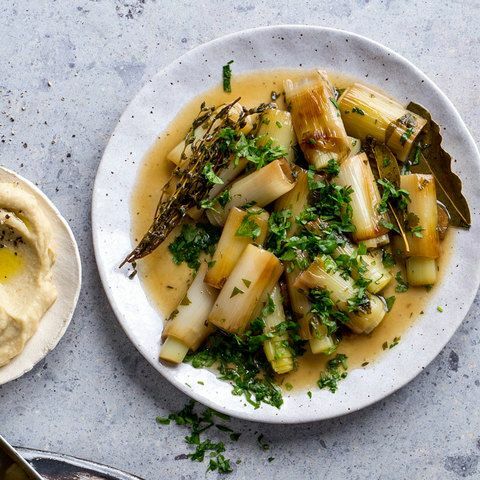 Get the olive oil hot in a large pot and add the leeks, cut side-down as well as the garlic to fry for about 2 minutes on each side until lightly brown. Now, add the thyme, bay leaf and the white wine, reducing the heat to simmer and leave it to tick away with the lid on for about 40 minutes. After 40 minutes, remove the lid and pump up the heat to reduce the sauce by half (with the leeks still in the pot). Finally, season with salt and black pepper and stir through the parsley before serving. If you’re jarring them, make sure both the jars and the leeks are steaming hot when the lid goes on, to create a sterile vacuum.